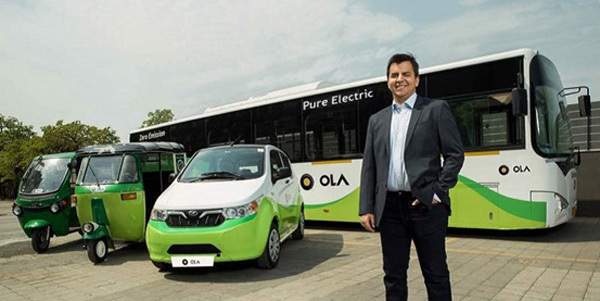 Cab aggregator Ola plans to add 10,000 EVs, mostly e-rickshaws, to its fleet in 12 months, and one million EVs by 2021. Last year, SoftBank-backed Bengaluru-based firm opened its first EV project in Nagpur with electric cabs, e-auto rickshaws, electric buses, rooftop solar installations, charging stations, and battery swapping schemes. In a boost to electric vehicles, Centre has clarified there is no need for a license to set up EV charging stations, nor any requirement to change the law for the same. Their logic: It’s the charging stations that are consuming electricity, which gets stored as chemical energy in the vehicles, therefore they are not directly selling electricity (only Discoms can), but merely billing vehicles for a charging service. Energy Efficiency Services Limited (EESL) chief called it “a very important step”. EESL, energy efficiency joint venture of public sector companies set up in 2010, runs 150 charging stations in Delhi, plans to start 2,400 more. Meanwhile, Centre’s Faster Adoption and Manufacturing of Hybrid & Electric Vehicles (FAME I) scheme that backs purchase of EVs is extended until September 30, 2018. To increase EV adoption, experts suggest FAME II subsidy be directly given to industry, without requiring state tie-ups, aside from tax exemptions to EV owners, tax incentives for installing charging stations, mandating 25% of parking for chargers, and tax incentive to landlords to lease out space for chargers. To increase EV adoption, industry experts suggest: direct FAME II subsidy to industry, without requiring state tie-ups, income tax exemptions to EV owners, tax incentives for installing charging stations, mandating 25% of parking for chargers, and tax incentive to landlords to lease out space for chargers. Indian IT giant Wipro and State Bank of India (SBI) will have 100% EV fleet by 2030. Wipro’s interim target: 500 EVs in the next three years, 1,000 by 2023. SBI, with over 22,000 branches in India, 206 abroad, will have EV corporate fleet in major cities by 2030, and charging stations for the staff. Bad news for diesel-petrol cars, latest study on Tesla electric car battery degradation has found highly promising results: 90% battery remained intact after use of 300,000 km. That’s several lifetimes of fossil fuel car. Tesla provides an 8-year infinite mile battery failure warranty, but it doesn’t cover degradation. Auto giants are blocking energy efficient cars until 2019 to “maximize profits” says a new study. But 100 new electric cars are coming in 3 years. Twenty-one upgraded cars will be re-launched in 2019, compared to only 6 in 2017. Electric cars models will “increase five-fold to 100 by 2021”, with higher driving-range. Elon Musk has denied The Economist reports of Tesla facing capital crunch and needing $3billion additional funding tweeting that his Silicon Valley car firm will make profit from the third quarter and “doesn’t need to raise money”. Musk said the use of robots in Model 3’s assembly caused production delays: “Excessive automation was mistake. Humans are underrated,” he tweeted. Canadian firm Cobalt 27, world’s largest cobalt firm backed by a Russian billionaire, may tie-up with Chinese car and battery companies, as China secures cobalt to make EV batteries. With a target to sell 7 million EVs a year by 2025, China’s EV sales may surpass 1 million this year. China beat the US in 2015 to become the biggest electric-car market. By 2025 annual global cobalt demand may touch 250,000 metric tons, and EVs may account for “35% of global market”. China plans to set an example of EV-adoption in Hainan, and phase out fossil fuel cars in the resort island. “New Energy Vehicles” will be introduced in a “scientific way” to make Hainan into a tourist hub with “green lifestyle” including a free-trade zone, horse racing and sports lottery. China’s quota includes seven-fold increase in NEV sale. Auto giant VW plans to enter electric-car era starting with tweaking its logo. The scandal-tainted, “too German”, brand is set to change from stiff to “colourful and approachable” image with a $25 billion electric-car makeover. Wooing buyers on digital and social media VW will rollout its battery-run cars with the I.D. hatchback in 2020, followed by an SUV, minivan and sedan.